Interviews with great players..... scroll down to read my interviews with some of the world's best rugby players. Quanti anni avevi quando hai iniziato a giocare a rugby? 2. What was your first rugby team that you played for? Quale era la tua prima squadra con cui hai giocato? 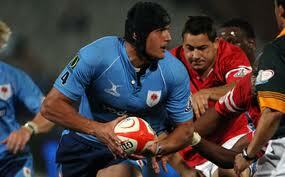 3. Who was your favourite rugby player when you were growing up? Chi era il tuo giocatore preferito mentre crescevi? My Dad, He was everyones favourite in my village,Malolo, and all the younger players looked up to him so did I.
Il mio babbo, lui era il preferito di tutti nel mio vilaggio,Malolo, e tutti i giocatori piu giovani guardavano lui anche io lo facevo. 4. Which position did you always want to play? Quale ruolo hai sempre voluto giocare? Wing. I did play wing until I got too heavy. Ala. Io ho giocato ala finche sono diventato troppo pensante. 5. Who is your best friend in rugby? Chi e’ il tuo migliore amico nel rugby? 8. What is your current team? I come from Yaro village on an Island called Malolo. 10. What other hobbies do you have? 11. What was the best advice you got when you started to play rugby? Quale era il tuo indizio migliore quando hai iniziato a giocare a rugby? Sacrifice, Patience and hard work...Dad always told me ¨regardless of the weather if you're meant to run, You still have to do it!. Sacrificio, pazienza e lavorare sodo...Papa’ mi diceva sempre pensa meno al tempo se sei destinato a correre, lo devi sempre fare!. Quale e’ il tuo cibo preferito? 13. How big are your feet? Come sono grandi i tuoi piedi? THANKS SO MUCH NOA HOPE TO SEE TO SOON!!!!!!!!! 3. Who was your favourite rugby player when you where growing up? 10. What was the best advice you got when you started to play rugby? You have a good opportunity in life, do not touch alcohol as it causes too much trouble! Hai un occasione nella vita, non toccare acool perche’ causa troppo problemi. 11. Who do you think will win the World Cup? Chi secondo te vincera il campionato mondiale? 12. Who do you want to win the World Cup? 13. What is your favourite food? 14. How big are your feet? I was four years old when I started playing club rugby. Avevo Quattro anni quando ho iniziato ha giocare a rugby per una squadra. Rob Andrew and Gavin Hastings. 10. What over hobbies do you have? Ciclismo, Gittara, Pianoforte, Basket, e praticamente tutti gli sport. 12. Who do you think will win the World Cup? 13. Who do you want to win the World Cup? Chi vuoi che vince il Campionato Mondiale? 15. How big are your feet? Chi e' il tuo migliore amico nel rugby? Quale e' il tuo cibo preferito? I was a very small and scared 6 year old. Ero un bambino di 6 molto piccolo e inpaurito. I played for Papakura Marist, a very big club in Counties Manukau, New Zealand. 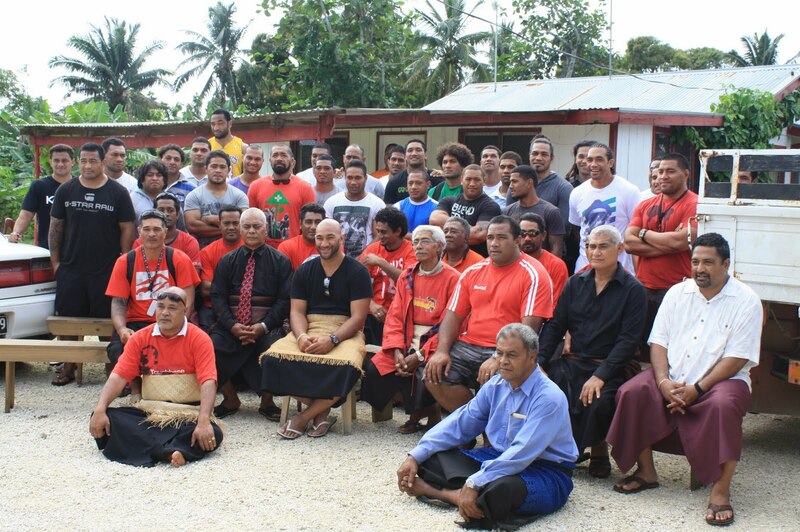 Ho giocato per Papakura Marist, una squadra molto grande in Manukau, Nuova Zelanda. This is one of the hardest questions as there are two players that I grew up watching and then had the pleasure of playing against. 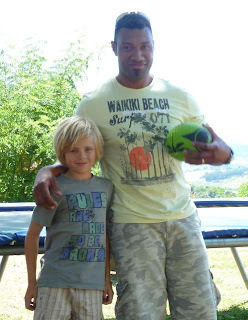 Jonah Lomu who I knew growing up and Christian Cullen. I played rugby with Jonah in Counties Manukau and then played against both of them a few years later….that was a happy and very sore day for me. Questo è uno delle domande più difficili siccome ci sono due giocatori che guardavo mentre crescevo poì avendo la fortuna di giocarci contro. Jonah Lomu che conoscevo mentre crescevo e Christian Cullen. Ho giocato con Jonah Lomu a Manukau e’ poi ho giocato contro tutti e due un paio di anni dopo... quello era una giornata felice’e molto fatticoso. I wanted to play centre because my father played that position. Volevo giocare centro perchè era ruolo che giocava il mio padre. Any one of my teammates. We have a very close team and I do a lot of stuff with them all. Chiunque dei miei amici di squadra abbiamo una squadra vicina e faccio molto cose con tutti loro. 5ft 7” I am usually the shortest in every team I play in. 173cm sono di solito il più basso della squadra. I play at around 85kgs. Believe it or not I once weighed a very heavy 101kgs. Gioco intorno ai 85kg. Credete o no mauna volta pesavo 101kg. I have just signed a two year deal with Prato I Cavalieri. Ho appena firmato un contrato per due anni per Prato I Cavalieri. I have represented NZ in Touch Rugby, Rugby league and Softball and have spent a lot of my spare time playing those sports. Other than sport you would find me doing something else that involves the outdoors like surfing, hiking or camping. Ho rappressentato NZ nel tag rugby, rugby league e il softball. Ma fuori dallo sport mi troverete ancora fuori facendo surf, e camping. A fitter man will always beat a skillful man. This is something that my father told me years ago, and being a stubborn child I ignored the free advice. It wasn’t until making older teams that I really understood how important that advice would be. Un uomo allenato batterà sempre un uomo con le mosse. Questo una cosa che mi ha detto il mio padre dei anni fa. This is a tough one. New Zealand has dominated the international tours for the last four years, but they haven’t had the best record when it comes to the world cup. No other country are in form so based on that I would have to say New Zealand. Questo è uno difficile. Nuova Zelanda ha dominato i tour internazionali per 4 anni ma non hanno avuto il record migliore quando viene il campionato mondiale. Ma nessun altra squadra è in forma siccome dovrò dire Nuova Zelanda. The first team I played for apart from my school was Old Scouts in Northampton. I didn’t really have one. I was more interested in playing than watching others. However, when I started playing at Northampton Saints there were a whole host of players who I admired and learnt from. Non lo mai avuta ero più interessato giocare che guardare . Però quando ho iniziato a giocare per i Northampton Saints cerano un sacco di giocatori che ammiravo. Always on the left wing. The first position I was put in was prop! I didn’t know any other positions so I said I was a prop. They soon realised that I was not a prop and in my first match I went from 1 to 15. I eventually went over to the wing which has been my favoured position for the rest of my career. Sempre sull ala sinistra.Il primo ruolo a cuoi ho giocato era pilone non conoscevo altri ruoli poco dopo scoperto che non ero un pilone e dalla prima partita sono passato dal 1 al 15. Poi sono passato all ala che è stato il mio ruolo preferito per il resto della mia cariera. I have made lots of friends over the years but Steve Thompson would be the one I am probably closet too. 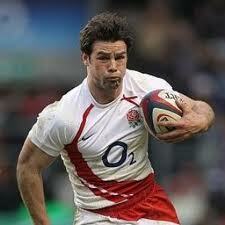 We were at Old Scouts and Northampton together and then in the World Cup Winning Squad for England in 2003. 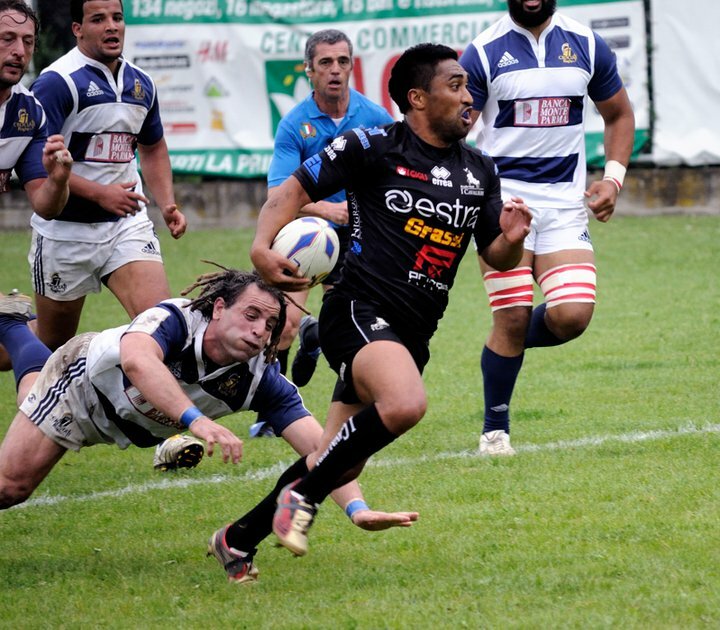 After that we also played for Brive in France at the same time. Ho avuto molti amici durante gli anni ilmigliore per me è Steve Thompson. Eravamo scout e a Northampton insieme vincendo il campionato mondiale insieme per l Inghleterra. E dpo abbiamo giocato di nuovo insieme per il Brive in Francia. 6. What was the best advice you got when you started to play rugby? When I was quite young Matt Dawson suggested to me that I ought to get a personal fitness trainer. So I did. 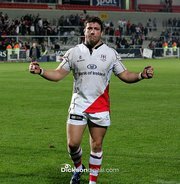 I paid a guy called Ron Still to train me and within three months I had changed shape and was playing the best rugby of my career. Quando ero abbastanza giovane Matt Dawson mi ha suggerito di prendere un allenatore di fisica personale .E lo fatto. Ho pagato u n uomo di nome Ron Still per allenarmie in tre mesi avevo fisico diveso e giocavo il mio rugby migliore. 7. Who do you think will win the World Cup? I would like to say England, but I am not sure they will do well away from home in New Zealand. If I was a betting man, which I’m not, I would suggest that the home team could be victorious. But you never know. Vorrei dire Inghleterra ma secondo me non vincerano essendo molto lontani da casa siccome direi la squadradi casa Nuov Zelanda. I love my wife’s roast dinners and I always enjoy Italian food. I am partial to a coffee and a Granola bar from Starbucks. Amo I carni che fa mia moglie e mi piacono anche I cibi Italiani.Mi piace un caffé e una Granola da starbucks. Thank you Ben and Jill for your time and help. Click on his picture to go to his website. Grazie Ben e Jill per il vostro tempo e aiuto. Premi sul la foto per andare sul suo sitto. 4. Witch position did you always want to play? 7. How much do you weight? 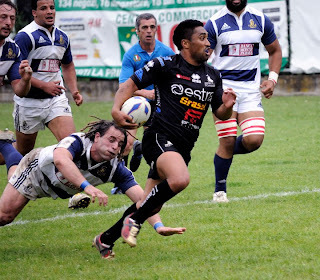 My dad played rugby in Italy with L’Aquila Rugby before moving to Argentina. There’s always be a rugby ball in my life. Il mio papa' ha giocato in Italia with l'Aquila Rugby prima di trasferisi in Argentina. c'e' sempre stato un pallone da rugby nella mia vita. I played for L’Aquila during summer holidays from Argentina and for La Plata. Ho giocato per l'Aquila durante le vacanze estive da Argentina e per La Plata. Number 8 was always my favourite spot, you are in touch both with forwards and backs. Numero 8 era sempre il mio posto preferito, sei in contatto sia con i davanti che con quelli di dietro. Gonzalo Canale and Martin Castrogiovanni are the best friends of mine. Gonzalo Canale e Martin Castrogiovanni sono i miei preferiti. I was born in Argentina from Italian parents and I’ve always felt Italian. Sono nato in Argentina da genitori Italiani e mi sono sentito Italiano. I Spend time with my young daughter. She’s one year old. Passo il tempo con con la mia figlia piccola. Ha un anno. All my dad’s advices were great! Tutti gli indizzi del mio Padre erano buoni! New Zealand has to be the odds on favourite. La Nuova Zelanda sono i preferiti. 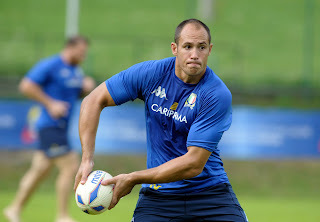 I’d be happy Italy to win the RWC, but it will be very very tough! Sarei contento se vincese l'Italia il RWC, ma sara' molto molto difficile! Grazie Sergio e La Federazione Italiana. Thankyou Isobel and Alastair for all your help, hopefully I can do some more interviews with you later in the year. Grazie Isobel e Alastair per tutto il vostro aiuto, spero di poter fare altri interviste con voi dopo nell'anno. I was 14. Before that I played soccer and rugby league. I really enjoyed soccer which I played until I was about 9. In my under-8s tem I scored 49 goals out of 56 in a season! Avevo 14 anni. Prima di quello giocavo a calcio e rugby league. Mi son divertito molto a calcio a quale ho giocato fino avevo 9 anni. Nella mia squadra dei under 8 in cui ho segnato 49 goal su 56 in una stagione! 2. What was the first rugby team that you played for? My first team was called Dundas Valley. They played in the Paramatta Junior competition in Sydney and our ground wasn’t far from Homebush, the Olympic Stadium. La mia prima squadra si chiamava Dundas valley. Loro giocavano nei tornei a Sydney e il nostro campo era vicino a Homebush, allo Stadio Olimpica. 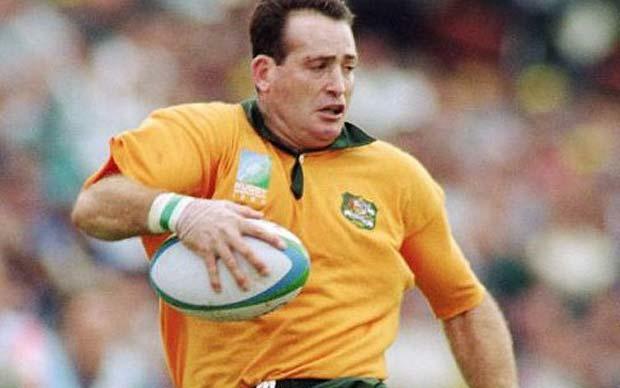 That was a guy called Ricky Stuart, who is now coaching the New South Wales state of origin rugby league team. Ricky played for the Canberra Raiders at half-back and he was my hero. Lui era un uomo che si chiamava Ricky Stuart, che ora e’ l’allenatore della squadra del New South Wales rugby league. Initially I wanted to play half-back because I’d come from that position in rugby league but then I got pushed out to stand-off. That’s a good question. 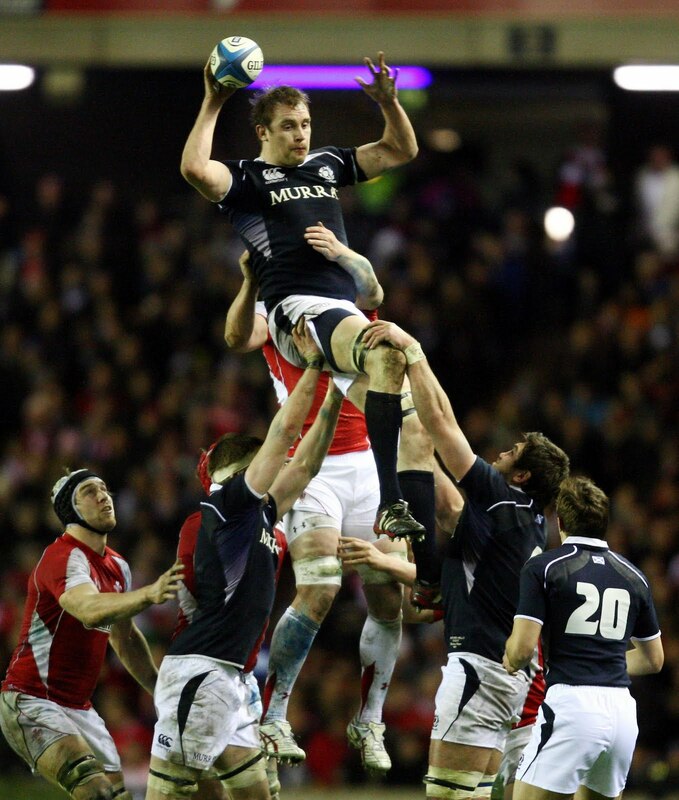 Probably Muffles (former Scotland and Glasgow centre Andrew Henderson). After spending such a long time at Glasgow I made some really good friends there. Quella e’ una buona domanda. Secondo me Muffles ( Andrew Henderson vice centro della Scozia e di Glasgow) dopo aver passato tanto tempo al Glasgow mi sono fatto davero tanti amici. 6. What other hobbies do you have? Sport in general. I love golf and playing table tennis against the boys in camp. I’d encourage youngsters to try as many sports as possible. Sport in generale. Amo il golf e giocare ping-pong contro I ragazzi al campo. Incoraggerei qualunque bambino a provare tutti gli possibili. 7. What was the best advice you got when you started to play rugby? It was from a real rugby fanatic called Ron McLean. His big motto was to enjoy every match as much as possible. Era uno fanatico di nome Ron McLean. Il suo consiglio piu’ grande era di divvertissi. 8. Who do you want to win the World Cup? Chicken and pasta – especially at Gambrini’s Italian restaurant in Glasgow. Pollo e pasta – specialmente dal restorante Italiano Gambrini’s a Glasgow. 10. How big are your feet? Size 9 and a half. Thankyou Isobel and Dan for all your help, hopefully I can do some more interviews with you later in the year. Grazie Isobel e Dan per tutto il vostro aiuto, spero di poter fare altri interviste con voi dopo nell'anno. Well here's a little bit about me, for those who want to know. I’m still quite young but at the moment it would have to be Manu Tuilagi and Billy Ngawini who is a friend of my family. Sono ancora abbastanza giovane ma per ora sono Manu Tuilagi and Billy Ngawini che e’ un amico della nostra famiglia. Per ora Mediano di apertura o centro. My team mates Vittorio and Pietro. My Dad always says the bigger they are the harder they fall, and being small that makes sense to me, And tackle like your life depends on it. In my opinion theres only one team in it and that is New Zealand it’s up to them if they win or loose. Nel mio oppinione c’e solo una squadra cioe’ la Nuova Zelanda conta su di loro se vincono o no. Thank you Ben and Miranda for your help. Non c’era mai un ruolo che volevo giocare ho solo giocato dove mi hanno detto di giocare. Ho giocato 6 Seconda linea, tallonatore e pillone. Giardinagio, studio, fissando altre persone! Thanks Bryan for all your help. I am an 13 year old Rugby crazy English boy living in Italy. I play rugby, watch rugby and pretty much know loads of stuff about Rugby. On my blog I hope to interview lots of players and include fun stuff about the coolest sport in the world.